automobiles, electronics, televisions, computers, mobile phones, LCDs, oil and oil products, silver, fruits, vegetables, coffee, cotton. 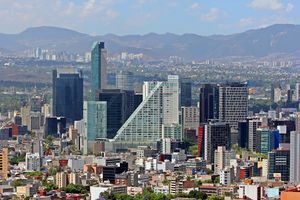 The economy of Mexico is the 15th largest in the world in nominal terms and the 11th largest by purchasing power parity, according to the International Monetary Fund. Since the 1994 crisis, administrations have improved the country's macroeconomic fundamentals. Mexico was not significantly influenced by the 2002 South American crisis, and maintained positive, although low, rates of growth after a brief period of stagnation in 2001. However, Mexico was one of the Latin American nations most affected by the 2008 recession with its Gross Domestic Product contracting by more than 6% in that year. The Mexican economy has had an unprecedented macroeconomic stability, which has reduced inflation and interest rates to record lows and has increased per capita income. In spite of this, enormous gaps remain between the urban and the rural population, the northern and southern states, and the rich and the poor. Some of the unresolved issues include the upgrade of infrastructure, the modernization of the tax system and labor laws, and the reduction of income inequality. Tax revenues, all together 19.6 percent of GDP in 2013, are the lowest among the 34 OECD countries. The economy contains rapidly developing modern industrial and service sectors, with increasing private ownership. Recent administrations have expanded competition in ports, railroads, telecommunications, electricity generation, natural gas distribution and airports, with the aim of upgrading infrastructure. As an export-oriented economy, more than 90% of Mexican trade is under free trade agreements (FTAs) with more than 40 countries, including the European Union, Japan, Israel, and much of Central and South America. The most influential FTA is the North American Free Trade Agreement (NAFTA), which came into effect in 1994, and was signed in 1992 by the governments of the United States, Canada and Mexico. In 2006, trade with Mexico's two northern partners accounted for almost 90% of its exports and 55% of its imports. Recently, the Congress of the Union approved important tax, pension and judicial reforms, and reform to the oil industry is currently being debated. Mexico had 15 companies in the Forbes Global 2000 list of the world's largest companies in 2016. Mexico's labor force is 52.8 million as of 2015. The OECD and WTO both rank Mexican workers as the hardest-working in the world in terms of the amount of hours worked yearly, although profitability per man-hour remains low. Porfirio Díaz, (1876–1911) in whose presidency rapid industrialization took place in foreign capital. 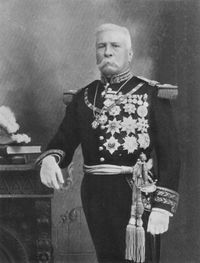 Mexican president Porfirio Díaz brought unprecedented economic growth during the last quarter of the nineteenth century. This growth was accompanied by foreign investment and European immigration, the development of an efficient railroad network and the exploitation of the country's natural resources. Annual economic growth between 1876 and 1910 averaged 3.3%. Political repression and fraud, as well as huge income (in)equalities exacerbated by the land distribution system based on latifundios, in which large haciendas were owned by a few but worked by millions of underpaid peasants living in precarious conditions, led to the Mexican Revolution (1910–1920), an armed conflict that drastically transformed Mexico's political, social, cultural, and economical structure during the twentieth century under a premise of social democracy. The war itself left a harsh toll on the economy and population, which decreased over the 11-year period between 1910 and 1921. [بحاجة لمصدر] The reconstruction of the country was to take place in the following decades. 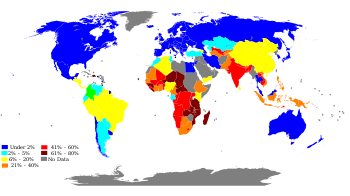 Map of world poverty by country, showing percentage of population living on less than $1.25 per day. Based on 2009 UN Human Development Report. 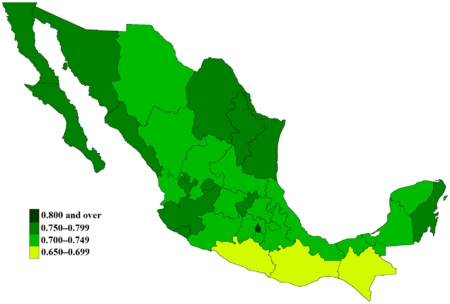 Mexican States by Human Development Index, 2015. 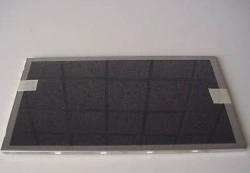 A Lanix LT10.1 high definition LCD assembled under OEM contract by Lanix for use in a Sharp LCD television. Mineral resources are the "nation's property" (i.e. public property) by constitution. As such, the energy sector is administered by the government with varying degrees of private investment. 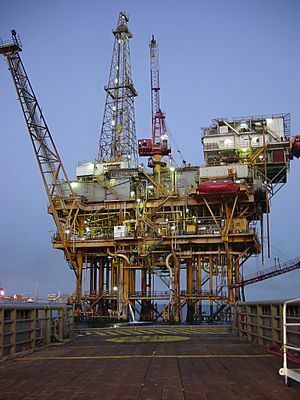 Mexico is the sixth-largest oil producer in the world, with 3,700,000 barrels per day (590,000 m3/d). Pemex, the public company in charge of administering research, exploration and sales of oil, is the largest company (oil or otherwise) in Mexico, and the second largest in Latin America after Brazil's Petrobras. Pemex is heavily taxed of almost 62 per cent of the company's sales, a significant source of revenue for the government. Banco de México is Mexico's central bank, an internally autonomous public institution whose governor is appointed by the president and approved by the legislature to which it is fully responsible. Banco de México's functions are outlined in the 28th article of the constitution and further expanded in the Monetary Law of the United Mexican States. Banco de México's main objective is to achieve stability in the purchasing power of the national currency. It is also the lender of last resort. Mexico has a floating exchange rate regime. Mexico’s monetary policy was revised following the 1994–95 financial crisis, when officials decided that maintaining general price stability was the best way to contribute to the sustained growth of employment and economic activity. As a result, Banco de México has as its primary objective maintaining stability in the purchasing power of the peso. It sets an inflation target, which requires it to establish corresponding quantitative targets for the growth of the monetary base and for the expansion of net domestic credit. The North American Trade Agreement (NAFTA) is by far the most important Trade Agreement Mexico has signed both in the magnitude of reciprocal trade with its partners as well as in its scope. Unlike the rest of the Free Trade Agreements that Mexico has signed, NAFTA is more comprehensive in its scope and was complemented by the North American Agreement for Environmental Cooperation (NAAEC) and the North American Agreement on Labor Cooperation (NAALC). ^ ""Gross domestic product 2014, PPP",". World Bank. July 2, 2016. ^ أ ب ت "Report for Selected Countries and Subjects". Imf.org. 2006-09-14. Retrieved 2011-04-16. ^ "The World Factbook". Retrieved June 11, 2015. ^ "Population Below Poverty Line". The World Factbook. ^ "GINI index (World Bank estimate)". Retrieved June 11, 2015. ^ "Ease of Doing Business in Mexico". Doingbusiness.org. Retrieved November 24, 2017. ^ أ ب "CIA – The World Factbook". Cia.gov. Retrieved 2015-06-26. 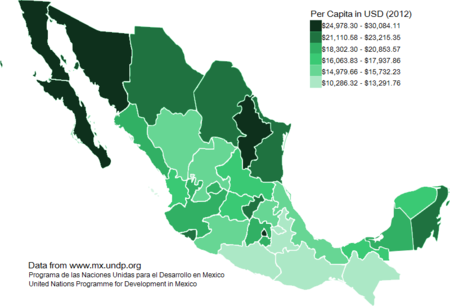 ^ أ ب "Mexico: Country Analysis". World Bank. 2014. Retrieved 2016-05-02. ^ أ ب ت "Mexico. Secretary of Hacienda and Public Credit (exchange rate from cia factbook)". Apartados.hacienda.gob.mx. Archived from the original on July 22, 2011. Retrieved 2011-04-16. ^ "Sovereigns rating list". Standard & Poor's. Archived from the original on September 4, 2015. Retrieved December 26, 2013. ^ أ ب ت Rogers, Simon; Sedghi, Ami (April 15, 2011). "How Fitch, Moody's and S&P rate each country's credit rating". The Guardian. UK. Retrieved May 31, 2011. ^ "International Reserves and Foreign Currency Liquidity – MEXICO". International Monetary Fund. May 18, 2011. Retrieved June 26, 2015. ^ Mexico. The World Factbook. CIA. ^ "The World's Biggest Public Companies". Forbes. Retrieved 2016-08-06. ^ "COUNTRY COMPARISON :: LABOR FORCE". CIA World Factbook. 2015. Archived from the original on May 30, 2016. Retrieved 8 August 2016. ^ "The Hardest Working Countries In The World". Business Insider. April 13, 2011. Retrieved June 11, 2015. ^ "What country works the most each day?". CNN. April 13, 2011. Archived from the original on December 6, 2011. ^ Thomas, Leigh (April 12, 2011). "Hard-working Mexicans upstage other OECD nations". Reuters. ^ "Archived copy". Archived from the original on May 8, 2011. Retrieved 2011-12-28. ^ Booth, William (May 3, 2011). "Siesta? What siesta? Mexicans work longest hours in world". The Washington Post. ^ "Desarrollo Económico" (in الإسبانية). Archived from the original on February 2, 2007. Retrieved 2007-02-17. ^ Cruz Vasconcelos, Gerardo. "Desempeño Histórico 1914–2004" (PDF) (in الإسبانية). Archived from the original (PDF) on March 14, 2007. Retrieved 2007-02-17. ^ "IMF World Economic Outlook Database, April 2010". Retrieved 2010-07-24. ^ Energy Information Administration. "Top World Oil Net Exporters and Producers". Archived from the original on February 16, 2007. Retrieved 2007-02-16. ^ Poder 360. "Top Latin America Marching to a Brazilian Beat". Archived from the original on April 15, 2010. Retrieved 2010-05-06. ^ "Reserva Internacional Registro" (in الإسبانية). Archived from the original on January 1, 2014. Retrieved 2013-12-31. ^ "Ley Monetaria de los Estados Unidos Mexicanos" (PDF) (in الإسبانية). Retrieved 2007-05-29.